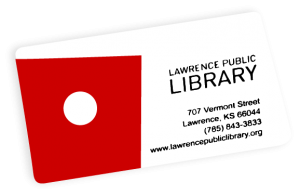 With your Lawrence Public Library card you have access to a world of resources to educate, entertain, and inform you. The library has everything from bedtime stories to the latest thriller. Want to learn to grow a garden, speak Italian, fix your car, or build a deck? Study the Civil War, mythology, Shakespeare, or the Beatles? Check out a movie, listen to Bach, or read the Kansas City Star? The library is the place for all of this and more! Any resident of Northeast Kansas may obtain a library card at no charge. You will need to show photo identification and proof of current residential address. A parent or guardian must accompany a child under 18 to approve their child's card. When you accept a library card, you agree to be responsible for fines for late returns and charges for lost or damaged items. You may check out materials without presenting your library card if you display another acceptable form of ID. *Lucky Day Books are extra copies of popular titles—you won't find them listed in the catalog, aside from copies that are currently checked out, so you must visit the library in person and look on the shelf to see if it is your Lucky Day. Up to 3 items may be in circulation at any given time to a patron with an unverified borrower card. Each time you check out materials, you'll receive a receipt that shows what you checked out and when it is due. Keep that receipt handy and you'll have an easy way to know when your books and videos are due. You can also check your account online at our catalog with your library card number and your PIN. Most items are renewable up to 4 times unless they have been requested by another patron. New adult fiction, all new DVDs, magazines, SAD lamps, laptops, board games, and ereaders may only be renewed once. No renewals are allowed for book club bags, celebration picture books, interlibrary loan items, or lucky day items. You may renew through your account accessed on the online catalog, over the phone at 785-843-3833, at one of the online catalog stations in the library, at a staff desk, or at the self check machines. If an item you want is already checked out, you may ask to have it held for you when it is returned. This is called a “request” or a "hold." You can make a request yourself online, or at one of the library’s catalog workstations – or a staff member can help you place a request by phone or in person. When more than one person requests a particular item, requests are filled in the order in which they were received. A maximum of 25 items may be requested at one time. Up to 3 items may be requested at any time for patrons with an unverified borrower card. A PIN (personal identification number) is issued with your library card. You may select a PIN consisting of between 4 and 8 numbers. To safeguard access to your account, you can change your PIN yourself at one of the online catalog stations in the library or from your online account. If you can present a photo ID you may also have your PIN reset at the Accounts desk. You’ll need your PIN when you want to check items out, view your library account, or reserve or renew items at one of the online catalog stations inside the library or from the online catalog. You can look at what you have checked out, renew materials, request items, and pay your fines with a credit or debit card by clicking on “My Account” at our online catalog. Note that a 50 cent convenience fee will be charge for all online fee payments. You will need both your library card number and your PIN to log in. Daily overdue fines are 15 cents per day per item for materials returned or renewed late. The maximum daily fine per item is $4.50. The only exception to this is for laptops, which will incur overdue fines of $1 per hour with a maximum fine of $50. As always, materials returned by the date they are due will incur no overdue fines. The library will inform borrowers by phone or email that items they have requested are available, that items are overdue, and that overdue charges have been incurred. If you wish to receive your notices by email, you may sign up for this service at the Accounts Desk or by entering your email address under "Settings" in your online account. E-mail recipients receive a notice three days before their items are due. Always contact the library if you receive a notice for an item you think you have already returned. *Notices are a courtesy only - you are ultimately responsible for your due dates and fines. Materials that have not been returned at 30 days past the due date are considered lost, and a bill is sent for replacement and processing fees. If the item is returned, the maximum overdue fine ($4.50 per item) is charged instead of the replacement cost. All pieces missing from multiple item sets must be returned within 60 days in order for the bill to be reduced. A borrower won't be charged both an overdue charge and a replacement fee on the same item. Any borrower that returns materials with damage will be charged replacement and processing fees for the items in question. Damaged items will be held at the Accounts desk for 30 days. The borrower may keep the damaged item after paying the fees for the item. After 30 days, if unclaimed the item will be sent to be recycled. Accounts with unpaid balances of $25.00 or more are submitted to a materials recovery agency 45 days after the balance is incurred. Accounts that reach this status are assessed an additional non-refundable $15.00 collection fee. What you check out on your library card is confidential. Patron registration and circulation records are exempt from disclosure through the Kansas Open Records Act and will only be released upon receipt of a valid court order or subpoena authorized under federal, state, or local law. Bring your library card each time you come to the library to check out materials or access an Internet or word processing computer. You can also use it from home to view your account, renew materials, reserve materials, and gain access to premium online resources on the library's website. You can access a virtual library card on your smartphone or other mobile device by using the cloudLibrary app. Your card will "expire" periodically so we can verify your address. If your card is not used for one year, it will become inactive. If that happens, you can reactivate your account at the Accounts Desk with a picture I.D. showing your current address. After three years of inactivity, accounts will be deleted. Contact us if your address or other personal information changes. Protect your account by keeping your card safe and reporting a lost or stolen library card immediately. Card owners are responsible for materials borrowed on their cards until they are reported lost or stolen.